When I first look up at the sun through those funky glasses, it appears as if someone had taken just a nibble out of a cookie. Donna and I are in Springfield, South Carolina, a small town south of Columbia. Knowing Savannah is only going to experience a partial (97% of the sun covered) eclipse, it’s time for a road trip. Furthermore, the coast looks to be socked in with clouds. 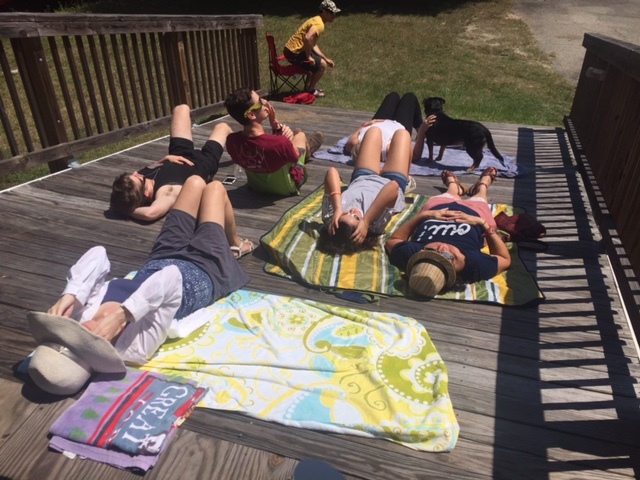 As the path of totality is passing by just 70 miles north of here, and Interstate 95 promised to be backed up with eclipse watches, we take back roads, heading northwest, hoping to find a place without clouds and within the totality of the event. Leaving Savannah on Georgia 21, we follow the river northwest, driving among the tractors pulling containers in and out of the port. 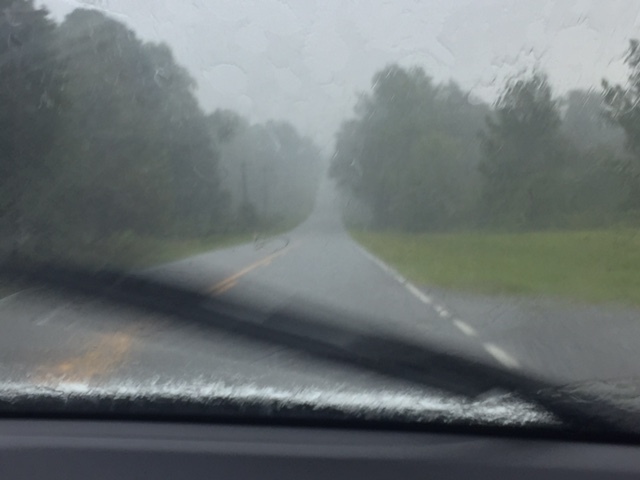 At Springville (Georgia, not South Carolina), we turn north on Highway 119 and cross the Savannah River. A few miles north of the river, 119 merges into US 321 and we head north. Attempting to work our way both far enough north to be in the path of totality and far enough west to avoid the coastal clouds, we take US 278, driving through pine forest and the occasional field of beans, corn or cotton. We stop in Barnwell, the gateway to the Savannah River Site (a Department of Energy Nuclear operation) and pick up a quick lunch at Burger King. Then we continue heading north, taking State Road 37. After Elko, which is in the path of totality, we start looking for a good place to watch the eclipse. There are clouds, but also large clear areas in the sky. We pull into the small town of Springfield. Southern Railroad used to run through Springfield, but the tracks were no longer there. Somehow, a caboose had been left behind and the swath of land that once were tracks is now a long park. 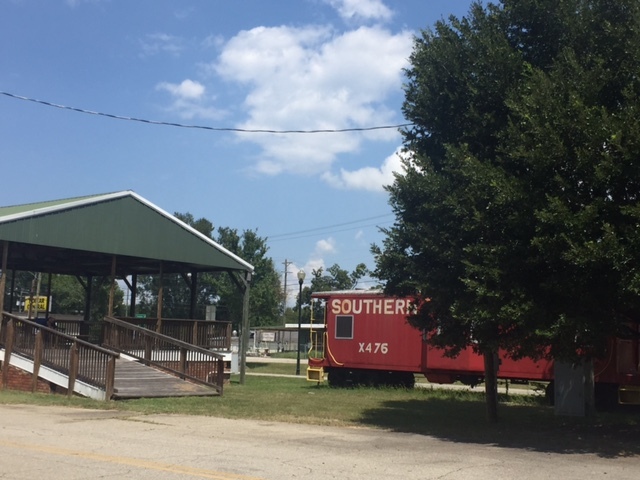 The rail beds have been paved over as a walking and bike path and a pavilion was built next to the caboose. We find a shady spot to park, get out of the car and after putting on the solar glasses, take a peak and see that the moon was slowly doing its magic. Totality is a little over an hour away. A few others also stop and we all gather in the park in the center of town. An African American man is there with his wife and children. We get to talking and I learn he’s from Springfield. He tells me the train stopped running around fifteen years ago. 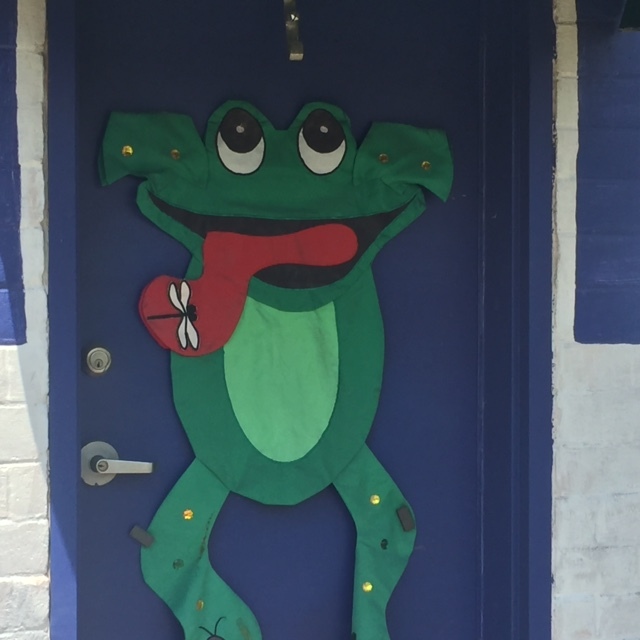 Then he points to another park and said we should come back the Saturday before Easter as the town holds a bull frog jumping contest. I mention Mark Twain’s story, but I’m not sure he even knows whom I’m talking about as he goes on about how far some of the frogs can jump. He then points west and tells me about a town with a Chitin festival and how the whole town stinks during the festival. “I think I’ll skip that festival,” I confide. Then he starts telling about another town where there was a poetry festival. “Really,” I say. “I might be interested in that,” while thinking that this doesn’t look like a hotbed for literary activities. He continues, describing how folks walk around gnawing on large drumsticks. I realize he was saying “poultry” and not “poetry.” “You got to come back,” the guy says. “All these little towns have festivals.” The man is proud of his place in the world! I take another look at the sun and the bite into the cookie is larger. The cookie monster is busy; or the moon is doing its magic. We decide to walk around the town, all three blocks, with a desire to see the sights and hopefully find relief from the gnats flying around us under the trees. They are annoying but thankfully are not the biting type. Most of the businesses are closed. The diner is only open Thursdays through Saturday. 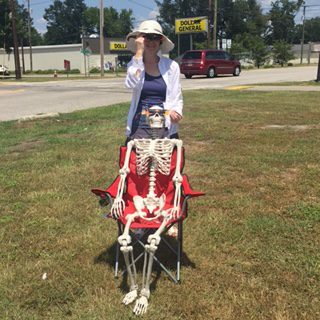 The pharmacy closed for the eclipse and, in front of the store, had sat a skeleton in a lounge chair. The bank is open but doesn’t look very busy. 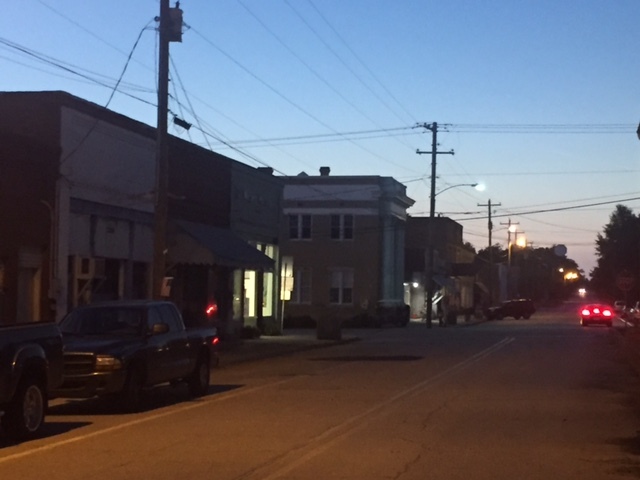 Just off Main Street is a convenient store that seems to be doing a fair amount of business. Looking back at the sun, it appears as if the cookie is half eaten. When we got back from our walk, we join the group on the pavilion. The pavilion provides little relief from the gnats and even though the sun was slowly disappearing and it’s noticeably cooker, it’s still warm and when not looking at the sun, the shade helps. A large cloud begins to make its way toward the sun and we wonder if we should relocate further west, but the cloud seems to vaporize as it got closer to the sun. We meet some folks from Savannah, a guy who’d driven a motorcycle up this morning from Gainsville, Florida, another couple from Jacksonville. The next time I look, the cookie is about three quarter’s gone. The family from Savannah’s dog is noticeable agitated and we discuss if it’s because of the eclipse or because he thinks it’s almost night and he hasn’t yet been fed. Looking away from the sun, the sky is a darker blue. The clouds are only seen on the horizon. I walk down to where there are trees and see hundreds of crescents reflecting through the leaves on the ground. Watching through the glasses, more and more of the sun disappears. The cookie metaphor no longer applies. It’s just a thin rim. If it was a cookie, it would have crumbled. Folks begin to claim space on the ramp leading up to the pavilion, laying out towels and blankets. We lie down on the ramp, looking up to get a better view. Insects begin to sing. Streetlights turn on. Cars driving through town have their lights on. Then it happens. Very quickly the rim of the sun seen through the glasses disappears. A few specks appear for a moment and then it’s gone. You can see nothing in the glasses, so I remove them and WOW. The corona is visible, flashing out from behind the moon, in a metallic bluish color. We hold our breath for it is incredibly beautiful. I don’t even bother trying to take a photo. Looking around, a few stars and planets are visible, but there is not enough time to orient myself as to which is which. I keep looking back at the dark block crowned with the corona. Then, way too soon, the sun begins to reappear with just flecks at first. We put back on our glasses and watch as the rim appears on the opposite side. 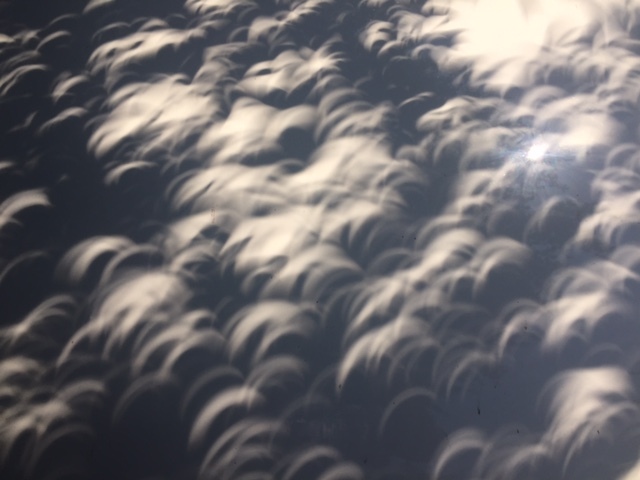 We began to clamp and cheer in acknowledgement that we did it, we witnessed the eclipse and it was incredible. We watch the sun through the glasses for a few minutes, but the excitement is over. People began packing up and soon everyone is heading home. As I walk back to the car that’s parked in the shade of trees, I notice the crescents covering the hood and take my last photo of the eclipse. We decide to take what is quicker way back and head off east toward I-95. A few minutes after leaving Springfield, clouds have covered the sky. Twenty minutes later, we’re in a downpour. When we get to 95, we realize that we made a mistake as the traffic heading south is at a standstill. We opt for US 17. We’re back home by 6:30 PM. Praise the Lord! Praise the Lord from the heavens; praise him for the heights! Praise Him, sun and moon; praise him, all you shinning stars! Thank you so much for sharing your story. I loved all of it. Since I stayed in Savannah and got only a glimpse, your photos and description are greatly appreciated. I saw the link on “Nextdoor” and didn’t realize until I had finished reading that you, the writer, were the pastor at the Skidaway Presbyterian church. I have attended many meetings at your church and just finished a watercolor workshop there. Thank you so much for sharing your church and your writing. A great adventure! Your excellent description was like being there. I think the little town would make a great background for a story.